JOAN SZYMKO, (b.1957) was born in Chicago into a family that placed a high value on education the arts— especially music. She studied choral conducting and music education at the University of Illinois (Urbana, 1978). Immediately after graduating she moved to the Pacific Northwest where she soon began composing choral music to fill repertoire needs of the church and women’s choirs she directed in Seattle in the 1980’s. Szymko moved to Portland, Oregon in 1993 upon the invitation to lead Aurora Chorus, a 100+ voice community women’s chorus, which she continues to serve as Artistic Director. Szymko founded a select women’s choir, Viriditas Vocal Ensemble in 1994. Leading Viriditas served as inspiration, as she composed prolifically during her years with this group (1994-2002). Equally inspiring was her collaboration with Robin Lane and Do Jump! Movement Theater. She has been a resident composer for Do Jump! 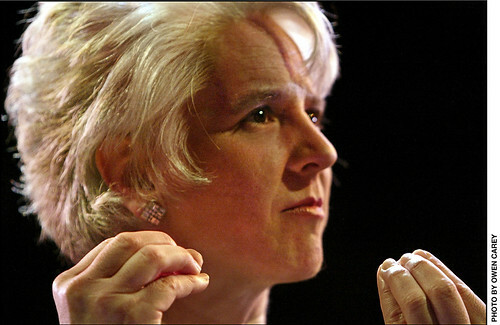 since 1995, performing her music with the company at their home theater in Portland and on tour, including runs on Broadway, at the Kennedy Center in Washington D.C.
Abundant lyricism, rhythmic integrity and vigorous attention to text are hallmarks of Joan Szymko’s diverse and distinctive choral writing. Fresh and inspiring, her text selections are as notable as her music. Especially significant is Szymko’s contribution to the body of literature for women’s voices. With over sixty published octavos in print, her music is sung by distinguished choral ensembles across the country and abroad including the IFCM World Symposium on Choral Music (Kyoto) and at four consecutive National Conferences of the American Choral Directors Association. The ACDA has recognized Szymko’s contribution to choral arts in America by selecting her as the recipient of the 2010 Raymond W. Brock Memorial Commission. The resulting piece, “All Works of Love” was premiered at all seven regional conferences of the ACDA in the spring of 2010. Joan Szymko’s choral music is published by Santa Barbara Music Publishing (primary), Roger Dean Publishing Company, earthsongs, Treble Clef Press and Yelton Rhodes Music. Szymko plans to launch a self publishing venture, Viriditas Music Press, later in 2010.